Gather your ingredients. A 3-4 pound chicken fits perfectly in the inner pot. Anything bigger than that and it’s going to get cramped in there unless you’ve got one of the 8-quart Instant Pot (the ‘regular one is 6-quarts which is the one I have – plenty big for my family of four). Using tongs or 2 wooden spoons, carefully flip the chicken over in the pot. I do this by inserting one side of the tong into the cavity of the bird then using the other to ‘grab’ the chicken and flip it. Continue cooking in ‘Saute’ mode for another 5 minutes while you chop the garlic and get your herbs (fresh or dried) and water ready to add to the pot. Press the ‘Cancel’ button to stop sautéing and quickly add the water or both to the pot. Sprinkle minced garlic and salt and pepper over the chicken then top with herbs. Don’t be afraid to buy fresh herbs if you’re making this chicken pretty regularly. I always buy the ‘Poultry Blend’ which includes rosemary, sage and thyme – all of which keep for up to 2 weeks in the crisper and chances are good you’ll find yourself adding the herbs to other things like roasted vegetables or our mind-blowing Blueberry Chicken Salad with Rosemary (I mean, you are about to have a few pounds of the most beautiful chicken meat ever in about 40 minutes). Carefully place the lid on the Instant Pot and turn to the ‘Locked’ position. You may have to wiggle it a bit to get it locked as the steam created by adding liquid to the hot pot will cause the float valve to pop up – I just gently poke it down with my finger then lock the lid in place. Once the lid is locked in place, turn the vent to ‘Sealing’ (the vent is the little flipper-looking thing on top of the lid). Select the ‘Manual’ setting which defaults to 30 minutes. For a larger chicken, and/or those of you living at high-altitude, add 15% to the cooking time. I find that 35 minutes works perfectly for a 4-lb. chicken at 5,600 feet above sea level here in Boulder. If you find you need more time, you can always replace the lid and add a couple more minutes. After a few tries ,you’ll have it down to a science. When the cooking time is up, allow the pressure to naturally release for 10 minutes to help seal in all those tasty juices – then flip the vent valve to ‘venting’ to allow any residual pressure to be released* before attempting to open the lid. *Do not stand over the pot while releasing the pressure as the steam is VERY HOT and let’s be honest, the last thing you probably need/want is a chicken-flavored facial. Carefully remove the chicken to a plate to cool before removing the meat from the bones. If you’re going to make bone broth (which I highly encourage you to do!) save the bones by placing them (and any of the drab-looking fresh herbs from the pot) into a freezer-safe container with a lid. They can be refrigerated for up to 3 days or placed in the freezer for longer storage. I almost always go on to make my broth right away — here’s a tutorial and recipe for that! But sometimes I don’t have the time or I need the Instant Pot another meal (like Lamb Curry or Chicken Chile Verde) and then I toss the bones in the freezer. In fact, I keep a ‘bone bag’ in the freezer so I toss in random bones and the ends of celery, carrots and onions so that when I am ready to make stock I’m pretty much 50% of the way there. Store the cooked chicken in a covered container in the fridge for up to 4 days. It’s perfect for topping salads (like this Kale Caesar Salad) or making into Curried Chicken Salad or Asian-inspired Chicken Salad lettuce wraps or anything else your perfectly tender, time-saving chicken-loving heart desires. Seriously, if you haven’t gotten on the Instant Pot bandwagon now is the time. A pressure cooker with the all the safety features and can do all the things is a busy cook’s dream. I use mine pretty much daily for steaming vegetables, making egg frittatas, homemade yogurt, soups, stews, rice, broth and more. Still on the fence about the Instant Pot? Obviously, you’re pretty curious about the Instant Pot if you’ve read this far! Let me just give you a loving little nudge toward the best purchase you’ll make all year. The Instant Pot has been updated for 2017 to include programmable features plus 2 new cooking modes: Eggs (for perfect hard-boiled eggs every time) and Cake (yes, you can even make dessert in your Instant Pot!) and saving the best for last… they’ve increased the max cooking time to 240 minutes (previously 120 minutes) which is ideal for extracting all the gelatinous goodness from beef bones (and chicken, too). Tender, juicy, fall-off-the-bone chicken in just 40 minutes. Perfect for adding to soups, salads and more. There are no stupid questions. In fact, that’s a great one! You do not need to do anything to the chicken – unless it has a bag of giblets (neck, liver, heart, etc.) stuffed inside the cavity. I never wash my chicken because any bacteria present on the bird will be killed by the heat of cooking. Washing it increases the risk that the bacteria would be spread to your countertop, sink, faucet and possibly even other foods or food preparation surfaces which increases your risk of a food-borne illness. You can pat it dry with a clean paper towel before adding it to the pot to minimize the splattering that happens when a water comes in contact with hot oil. Hope that helps! Good luck with your first whole chicken! Is ‘manual’ equivalent to high pressure for non-instapot pressure cookers?? 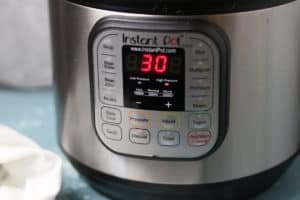 On the Instant Pot the ‘Manual’ mode refers to the mode that doesn’t have a preset time or pressure like rice, porridge, beans, poultry, etc. The time for the Manual mode can be set anywhere from 1-120 minutes and the pressure can be set to either high or low. That’s said, for this recipe ‘manual’ does mean high pressure. Jessica Beacom is correct about “washing” the chicken. After 35 minutes of high pressure cooking, it’s quite doubtful that bacteria are an issue. You’re basically autoclaving the chicken. Jessica is quite correct, too, about spreading bacteria while washing. This practice does have the potential for spreading bacteria all over. I grow weary of washing down counter-tops with bleach/water combination. Based on my 15+ years of experience using a pressure cooker at altitude (anywhere from 5,000 to 10,000ft above sea level), research and discussion with local extension agents I have disagree. A pressure cooker such as the Instant Pot is designed to reach 15 bars of pressure when the lid is locked and the unit is in use. It isn’t possible to reach the full 15 bars as you get above 3,000 ft above sea level thus the need to increase the cooking time. Your experience may be different depending on your location, pressure cooker and the recipes you’re preparing. However, in the interest of food safety I err on the side of caution when sharing recipes like these. Correct, except that pressure cookers operate at 15 PSI (pounds per square inch)… not 15 bar. A “bar” is a metric unit of pressure that equals approximately 15 psi. A 15 bar pressure cooker (approx. 225 psi) would have a saturation temperature of roughly 397°F! That’d be one HOT chicken! LOL Loving my new Instant Pot, btw… gonna have to try this whole-chicken recipe. I made this tonight, and I ABSOLUTELY see myself doing more whole chickens in the future. Thanks for the directions, they were great. Thanks, Diana! Glad that you found this recipe so easy to use. What would you recommend doing with the extra juices after the chicken is out? I seem to have quite a bit and it looks very yummy- but should I dilute it a bit to thin it out some, or drink it at is? Or not at all? Haha. I am saving it in hopes you get back with me tomorrow and I can do something useful with it. I also saved the bones to make a round of bone broth. Hi Brianna, sorry for the delayed response! We would recommend adding it as part of the liquid when making the bone broth. You could also add it to mashed potatoes or cauil-mash or make gravy with it. How long would you cook an 8.5 lb chicken? Hi Jackie, wow that’s a big chicken! You should not have to increase the time. You can always add more time if it’s not to temperature (160 degrees F). Looks so good! I came here looking for an instant pot bone broth recipe, but this will be perfect to do right before! Question about the bag of giblets that come inside the chicken…do I throw those in with the full carcass and bones to make the bone broth? Or don’t use the bag, and throw out all the innards? Hi Vayla, you can add this with the bones to make the broth. I so enjoyed this recipe the other night; making it again since Sam’s had these sustainably raised chickens on special! This time, the kids would live tacos, so I’m leaving out the garlic and using onion and oregano and chili powder. We’ll see how it goes. Yay for a great sale on chicken! I love your idea to use onion, oregano and chili powder. Our Homemade Taco Seasoning would also work well for this. It was super yummy with black beans and avocados on a bed of lettuce! Kids loved it with beans and salsa in tortillas. I still made it into broth, and that was excellent, also. Thanks for a great recipe! Hi Jessica….I made this last night, and it was a little overdone to my liking. Still delicious! I’m at 5000′ elevation so I went with the 35 minutes for my 5 lb chicken. Next week I will try 25 minutes with NR. I did want to say that the flavor and concept is just what I get with my 40 year old Romertopf. But the IP is a lot less work and cleaning, so I will store my old pot. Glad to hear you like the ease and convenience of the Instant Pot. Thanks for sharing about your altitude and timing for a 5lb. bird. I made one of similar size the other day and needed to do it for 37 minutes plus natural pressure release (I’m at 5,500ft). Perhaps it’s because I have an older model… anyways I agree with you that the flavor and convenience is king once you get your timing down. This looks simple and easy. Is it possible to add vegetables on top of the chicken to cook at the same time (e.g. potatos, carrots, onion)? You could place the chicken on the rack inside the Instant Pot and then add veggies though I will say that they may become very soft after 35 minutes of cooking. A work around for that would be to leave them in big pieces so they don’t get mushy. Love this recipe! Just tried it today – I was wondering, can you save the liquid that’s left in the pot for anything? Hi Erika! Great to hear you enjoyed this recipe. Yes, you could save the liquid to cook with if you’d like or if you plan to make bone broth, you could add it as part of the liquid. I’ve used this method to prepare a whole chicken weekly since I first tried this. 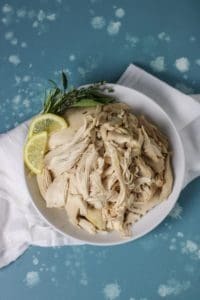 It is wonderful just as chicken served with veggies, but I’ve also used the meat for tacos, your slow-cooker buffalo chicken, and to add protein to soups. LOVE how easy it is to prepare a whole chicken! I just need to learn a better way to remove the meat- currently I pull it off with clean hands. Then I use the bones, etc. to make bone broth. Thank you again for sharing! 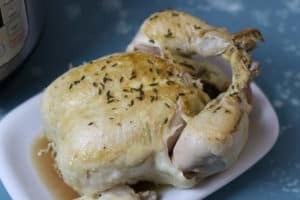 Can I cook a whole chicken that is still frozen? Yes, you can. I haven’t tried it yet but I’ve heard that you can and it will just take longer for the Instant Pot to come up to temperature before it starts to cook. I have made 4 times now and comes out perfect every time. Thank you! Turned out amazing! Perfect simple recipe!! First time cooking up a whole chicken in my Instant Pot to use the meat at a later time. Thanx for the most helpful recipe! 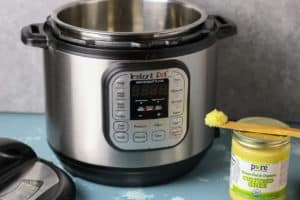 I’m still kind of a newbie with my 8 qt Instant Pot but will say I LOVE every time I use it! Linds, this is so great to hear! Glad you found this recipe helpful. Happy Instant Potting! Hi, I’m after your kale Caesar salad as I just absolutely love, love, love kale, did I say I love kale but I couldn’t click through to the recipe when I was on your blog. Can regular butter be used if you don’t have ghee? What about coconut oi;? I forgot to check pound limit for my 6 qt instant pot. I’m 1 pound over your recommendation. Can I still use my 5 pounder for my 6 pot ( you mentioned it would be cramped) or should I cut it and risk juice lost? Honestly, I often use chickens that are just over 5lbs. and they do fine (albeit take more cooking time). I hope that helps! You can use either button. The Poultry button is preset for a specific amount of time but you can adjust that up or down depending on what the recipe calls for. 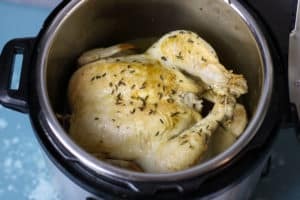 Could I cook two 3/3.5 lb whole chickens at once in my 8-qt IP? How would that change the time and amt of liquid? Great question – to be honest, I don’t know if you could cook 2 smaller chickens at once as I haven’t used the 8-quart model. That would definitely be something I would consult the operators manual for. This site is also a great resource for pressure cooking and you may find your answer there. Sorry, I can’t say for sure how to proceed on this one. The instructions say not to fill more than 2/3 full with meat or veggies on my 8qt Bella. If you stay under that, the time and liquid should really not change. The bottom chicken will likely be more moist sitting in the juices and the top chicken will cook as if on the rack similar to if you cook your meat on top of veggies. I prefer my meats cooked on the rack. Since it’s all preference, you’ll get the best of both worlds. Thanks for your input Miranda. Super helpful! Just made this chicken! Can’t believe how easy it was and how crazy good the chicken is. Loved going out to my garden to snip basil, lemon basil and rosemary to use in this. Thanks for sharing, Debbie! How wonderful to be able to use your own homegrown fresh herbs. Do you need to place the chicken on a rack or just add the water directly to the pot? How does placing the chicken on a rack affect the cooking? Will it be drier since it isn’t sitting in a liquid? Hi Jamie! No you do not need to use the rack in this recipe. Am I the only one who had the skin stick to the bottom of the pot when I flipped it for the first time in the sautéing process? How can I fix this? I used ghee just as directed, and tried to make sure it fully coated the bottom of the pot before putting the chicken in. I don’t like non-stick pots so I am hoping that is not my only solution. So sad to see my little skinless chicken :-/ help from anyone would be greatly appreciated! Thank you! Typically this sad loss of skin is due to flipping the chicken too early. You just need to let the chicken cook a little longer. 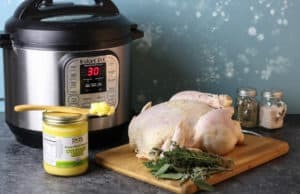 Though we do our best to estimate cooking times, factors such as how cold the chicken is, the amount of moisture in the skin, the size of the chicken, the age or model of your Instant Pot and even altitude can all play into how long each step takes. That said, when the chicken flips easily (meaning the skin releases easily from the pan) then you know it’s time to flip that bird over. The same goes for non-nonstick cookware and cast iron. I hope that helps! Made this for Christmas Eve and it turned out great. It was a huge hit with the guests. I added a few more herbs and cooked it on the rack. I also broiled it in the oven for a few minutes afterwards since it was the main course. 30 minutes in the instant pot was perfect for our 4-1/2 lb chicken. I have the Bella brand from Lowe’s and it worked just fine. 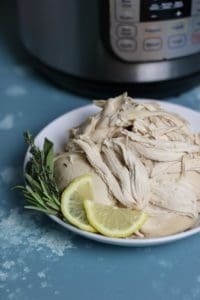 Jessica, I received an Instant Pot for Christmas and this was the first meat recipe I tried. Your directions/tutorial was perfect for a beginner like myself. The chicken came out just as you had “predicted” and was delicious. Thank you for your excellent “assistance” & recipes as I learn my way around this new gadget! Bone broth is next!! We love hearing this! Happy Instant Pot-ing! 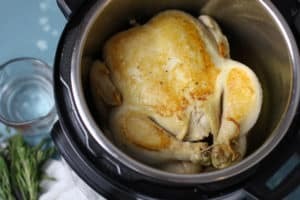 have you ever tried to stuff the chicken with traditional bread stuffing and then cooking it in the instant pot? No, we have not. As with stuffing any bird, I’d be concerned about food safety and the internal temperature of the stuffing (now mixed with juices from the chicken) not reaching a safe internal temperature of 165F. I also think that the stuffing may become very wet since the Instant Pot uses a wet-heat method of cooking rather than the dry-heat you get from the oven. That’s just me take on it though. If you try it and have great results, we’d love to hear about it so others can benefit from your experimentation. Thanks! my Instant pot manual is 10 minutes not 30. What should I do about that as far as the instructions goes. You should be able to adjust the cooking time using the +/- or up/down arrows on your Instant Pot. Awesome! And you are so welcome! Hi do you know if its the same time to cook a quartered chicken and if it will work the same way? I would decrease the cooking time by 25% then check to see if you need to add a few more minutes after it finishes cooking the first time (chances are good that it won’t but it’s easier to add more time than to have overcooked chicken). I live in Boulder too and just found this blog. YAY!!! Where do you buy your chicken and poultry herbs? I like the idea of $11 🙂 Thanks! You can find the herbs at most any grocery store. If they don’t have the ‘Poultry Mix’ you can use thyme, rosemary, and sage. Often I’ll have more fresh herbs than I can use for one chicken so I freeze them then toss them into the pot with the next chicken I make. Made this yesterday. Turned out perfectly. I followed directions, but added 2 halves of a lemon inside bird. Came out moist and tender. Will never buy another rotisserie chicken again! Thank you!!! You could try adding a little less liquid since the chicken will release quite a bit of liquid while it cooks. 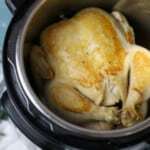 Do you have a recipe for cooking a whole chicken in a crock pot? 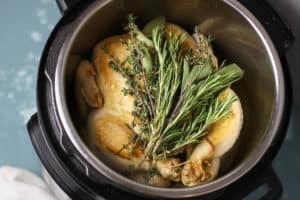 We don’t have one on our website but from experience, you can place a whole chicken in a slow cooker and cook on LOW heat for 6-7 hours (depending on your slow cooker). I usually create a ‘bed’ of quartered onions beneath the bird to keep it out of the liquid that it will give off and to infuse it with extra flavor.